The Korean War is a War in which UN Security force could not win. Before the battle in Chosin started, everyone had believed the American army could win and the War would end soon.The American army had been winning and obviously had an advantage in their Airpower and other strategic tools with new technologies. However, they had a huge difficulty in fighting in Chosin where the temparature becomes even 45 degrees below zero in winter. On the other hand, Chinese force took advantage of their knowledge of the environment.This case will examine what kind of factors cornered the American force into the difficult condition that made them unable to win. The reason of the debacle of American strategy in Korea War is thought to be the wishful thinking of the United States-dominated United Nations command, and it brought on the violation of this rule with respect to the Chinese People's Liberation Army. To defend their own land, the Chinese force had to have a plan which reduce American advantage and catch Americans unaware. At that time, it was just after the domestic conflict in China. So China had a number of soldiers but did not have enough weapons to fight with. To cover the disadvantage, the Chinese military sent hundreds of thousands of personnel that was unpredictable by UN force. From the night of October 15,1950, the highly disciplined Chinese combat ingantrymen walked accross the Yalu bridges and hid themselves in the mountainous North Korean hinterland, where UN force could not penetrate.The Chinese soldiers were small for American average but they were well trained, could carry as much as American army did with only few rice bolls, and they could march twenty miles for fifteen nights in succession through the mountains and valleys of North Korea. They hid in mountains in daytime to avoid the attacks by American Air-force, and they move or took the American army by surprise in the night time. 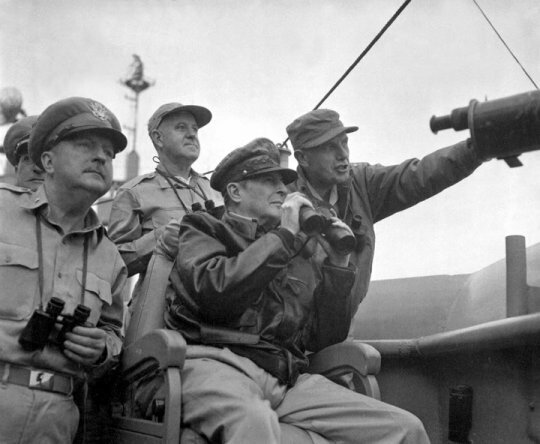 On the other hand, Douglas MacArthur who was the commander of the American army was optimistic about the battle because of his former successes in strategies in the War in the Pacific.He was almost an hero in America at that time. They thought the North-Korean army was almost destroyed by their aerial bombing, and they underestimated Chinese force as just a formal support for the neighbor countries. So they ignored the warning by China and they cross the 38th parallel, and they even ignored the notice that Chinese made, telling that they would destroy the American army if the army comes into mountains. In addition to it, the commanders made the strategies that do not concider the geography or the temperature in Chosin. Because of the freezing temperature there, the tools did not work well and the soldiers lost their motivation to fight. The American army was also isolated completely in the mountains and it was very difficult to have enough supply for the army. At the beginning of November, it started to snow in Chosin and there was a sudden drop in temperature. 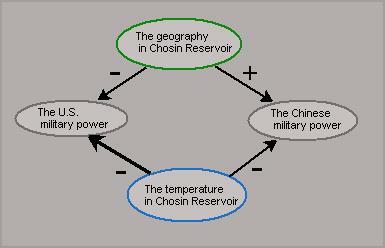 The periphery of Chosin is more than 1,000 meters above sea level and it becomes minus 30 degrees in winter. Even though the American Army had a huge fatalities and could not in Korean War, there was a great endeavor in the battle in Chosin. 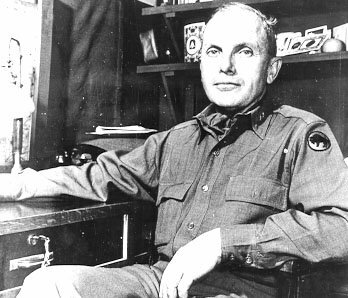 Oliver P. Smith was a General in the U.S. troop.He was good at shorthand and his document of the War contributed a lot for the historical record after the War.Shortly after he started to serve in Chosin, he started to wonder about the orders from the American commanders. The commanders did not know about the actual situation in Chosin and their orders were unreasonable for the army who were really experiencing the battle in Chosin. So he made all the American army stay together in Chosin against the command to spread the armies in the mountains. If he have followed the command at that time, all the Amrican troops must have been destroyed in the War. He also made an effort to learn about the geography in Chosin to fight and stock the food for the military. The open battle runway was made by his suggestion to secure the provision for the army who stay in an isolated mountain too. Thanks to his imagination and excellent works, the worst situation of the annihilation of the Amrican army was avoided. Marguerite Higgins was the first woman to win a Pulitzer Prize in 1951 for international reporting. When Korean War started, she moved to South Korea where she reported the fall of the capital, Seoul. First, the U.S. military commanders insisted that women should not belong at the front of War and ordered her to leave the War. 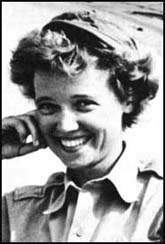 However, she made an appeal to General Douglas MacArthur to let her report the War. MacArthur reversed the orders for her enthusiasm. She actually stayed with the armies in Chosin and reported the battlefront as a first female war correspondent in Korean War. She became popular and known to the world for her energetic job. 5. Actors : China, The United States, North Korea, South Korea, the United Kingdom. The War was a conflict between two countries, North Korea and South Korea first. Many countries entered the war later for their interests. For the battle in Chosin, the main actors are China and the United States. It was a civil war in Korea at that time, but it can be said to be an international war because they are divided to be two independent countries today. Even though China, South and North Korea and the U.S.A. are the major actors, it can be seen that a lot of countries participated in Korean War as Security Forces and had a few fatalities. The numbers are huge compared to other sourses. It seems most Japanese sources include the number of the missing from Korean War in the fatalities. The number of fatalities in North Korea is larger than that of Sounth Korea because of American aerial bombings in North Korea. From this resource, it seems North Korea had the most damage in the war both in Military and Civilian. It can be said this is because more battles took place in North Korea and American aerial bombing killed a lot of non-military people. In the data above, the fatalities of each country, U.S.A., Japan and Korea differ a lot. It seems U.S. information only includes the military fatalities while Japanese and Korean includes both military and civilian death. There is still a huge difference between Japanese and Korean information. It can be assumed that Japanese information includes a lot of people who were missing in Korean War and have not unidentified yet in fatalities. ( Unlike the U.S. fatalities, it is difficult to determine the number of the fatalities of China and Korea. It was not common for Chinese and Korean soldiers to wear a name tag at this time. So a lot of the missing from Korean War are still unidentified.) It also should be noted that in Korea as a battlefield, a large number of civilians including women and children were killed in the War. Atthis point, the source by the Korean government can be the most reliable in this three as the number of total death of both military and civilians. Therefore I estimate the fatality in Korean War is 1,560,000 in my case study. The Chinese force and the U.S. force did not fight directly over the environmental resourses, but the weather affected their fight. 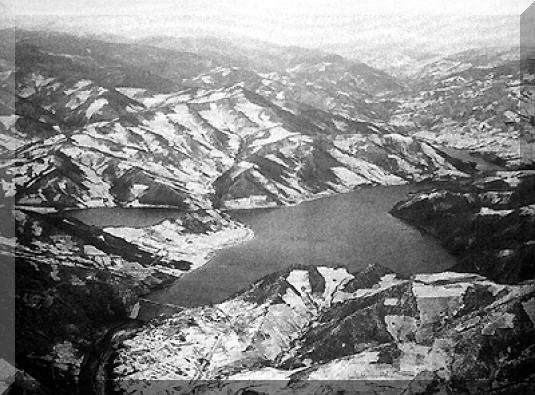 The freezing weather in Chosin reservoir did not only made it difficult for both armies to fight, but it also even affected the consequence of the whole War. Because of the low temperature, the soldiers lost their motivation to finght, the weapons did not work well, and it was hard to convey and strage the provision for the army.The U.S. army underestimated the difficulty to have a fight in Chosin where it becomes average minus 30 digree in winter and it led them to leave the war without ending it. 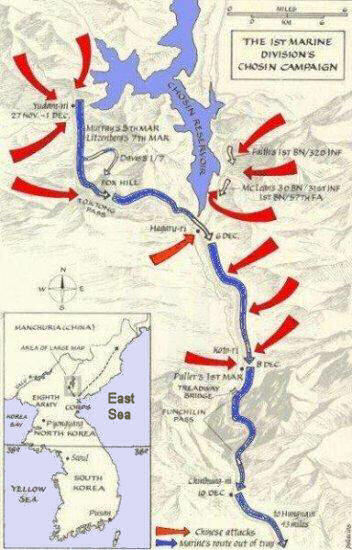 The Chinese military took advantage of knowing the geography of mountains in Chosin Reservoir while the American military found it difficult to fight in the mountains, being surrounded by the Chinese soldiers hiding. The freezing weather in Chosin Reservoir in Winter made the both militaries weaken and deprived the soldiers motivation to fight. However, since the U.S. commanders underestimated the battle in Chosin, the cold temperature affected the U.S. military more. This caused the indecisive balance of power of the armies, and the War lingered longer. A truce was made in July in1953 for Korean War, and the War was practically ended. However,a lot of legacies that should be solved are left. The American force as Security forces that had been thought that they would win and end the War soon had much difficulty in fighting in freezing weather in North Korea. The lack of strategy that conciders the geography in mountains in North Korea also cornered the U.S. force into a difficult condition. No one had a victory in this War. Although the battle was ended, the goal of the two countries where the same ethnic live have not been found yet. The efforts such as political negotiations toward the mutual understanding of the countries are still needed. In this meaning, I would say the conflict is in stalemate. Lowe, Peter. "The origins of the Korean War". Longman Group Limited. New York. 1986. Lowe, Peter. "The Korean War." St. Martin’s Press. New York. 2000. Stone, I. F. "The Hidden History of the Korean War." Monthly Review Press. New York. 1969. Korean Overseas Information Service. "This is Korea." Seoul International Publishing House. 1986. The dictionary of South and North Korea. The Korean government. All sourses in Japanse and Korean were translated into English by the author.